Info "Did you know that opposing sides of a die always equal 7?" Cheater! is one of Ashley's Microgames in WarioWare: Smooth Moves. There will be a die on a random side. 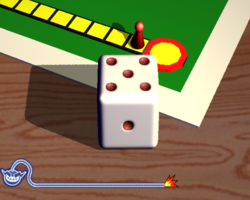 The player will have to turn the die with the Wii Remote to the number prompted on-screen. The in-game description mentions as a hint that the opposing sides add up to 7. 1st level difficulty: There will be a decent amount of time to turn the die. The number can be easily found. 2nd level difficulty: There will be less time. The number is harder to find. 3rd level difficulty: There will be little time. The number is even harder to find. This page was last edited on February 19, 2018, at 23:06.